THIS IS THE BEST, intensive one-day creative letterpress workshop you can sink your teeth into. 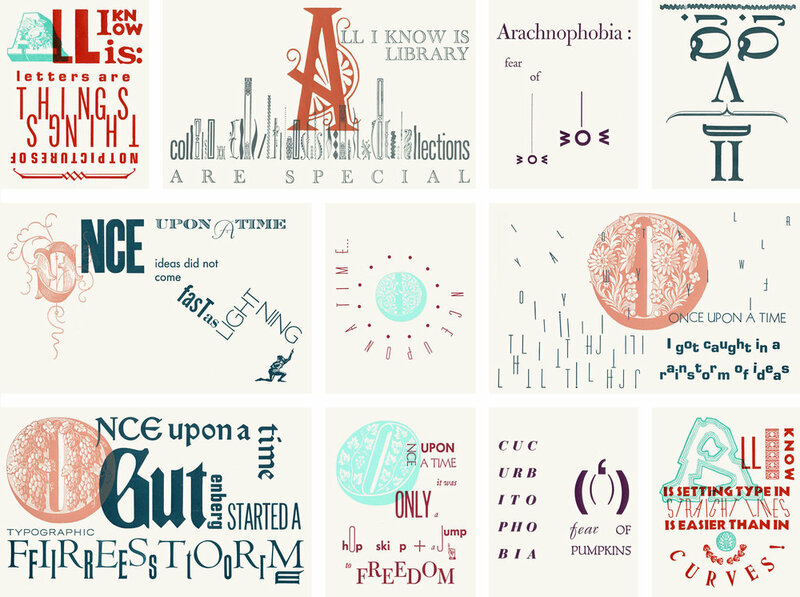 For students, it's a little history, diving into a sketch-free form of creative thinking, a bit of writing, and typographic high jinks with a whole lot of hands on. For professionals, it's a different R & R : rerouting the way you think and refueling your creative engine. ⬆ This workshop project is all about density and being observant. You can see where you'll be headed in the photo above. On the left is the lock up of fourteen 4" x 5" pages of wood & metal type used for the 2nd color (red). On the right is the final 2-color printed broadside which makes up the text block of an accordion-fold book. The 3rd image below shows the architectural form of the final book. You're in charge of only one little page out of 14, but it's yours alone to command as you will. You are encouraged to color outside the lines, play, and experiment with your typographic opportunities. THE TOP IMAGE shows the results from a number of workshops working with a number of schools. The double pages are workshops with fewer students (6 - 8) where they work in spreads instead of single pages (9 - 14). 9 working hours plus lunch. For your workshop, wear comfy shoes (our concrete floor is hard) and work clothes (you will get dirty). Dress for the weather—we are not air-conditioned, and in winter the heat rises to the ceiling 22 feet up. We supply all tools and materials. Be sure to bring questions, some knowledge of the Lead Graffiti's work, your camera, and a notebook to record your process. We start a short tour of our lab and a quick demonstration of hand setting wood & metal type, a few portfolio pieces and you're on your own, exploring type cases, mixing and matching, sorting through design options. Each person is responsible for the words, composing the type, ornaments, borders, punctuation and spacing for one page in what will become a 14-page hard cover book (complete with printed cover, title page, and colophon) by the end of the day. These are some of the more than 60 different meander books produced since 2011 that are included in Rare Books at the Library of Congress and Special Collections at the University of Delaware. Take a break with a pizza lunch in the studio to talk about your page design and ask questions about creativity, typography, old-school printing, and anything that keeps you focused on your project. During the workshop, each person will print 3 copies of their book's cover using a hand-cranked press. Once all the pages are set and locked up, everyone will print their broadsides, which become the text blocks for the books, on an automatic press. In this meander book workshop, a typography student tries her typing skills on the Intertype's "non-qwerty" keyboard before casting her name in hot metal. Bonus no.1 : You'll sit at our Intertype line caster and keyboard your name in "hot metal" for use in the colophon. Mark Twain called Ottmar Mergenthaler's original machine (invented in nearby Baltimore in the 1880s) the "8th wonder of the world" for a reason. 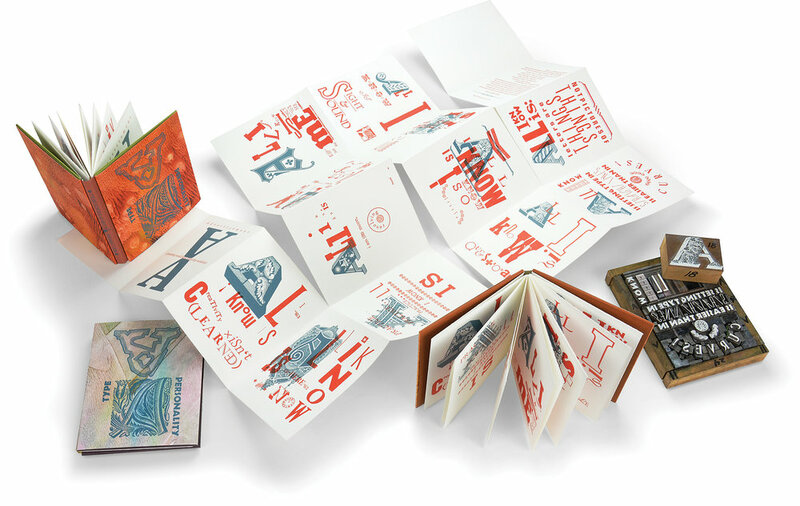 After everything is printed, you'll do some nimble folding and careful tearing to transform a single flat sheet of paper into a smart little accordion book (shown below). With no sewing and no gluing, the binding will hold the book together with a remarkable no-visible-means-of-support construction. This photo shows 3 copies of the final book + the text block unfolded to show the meander construction, and the lockup for one page with initial cap. Bonus no. 2 : You'll walk out with a finished copy of the book and enough printed material to produce 2 more books on your own, so you can practice what you've just learned. You'll have a finished portfolio-worthy piece and some cool talking points for future interviews. Bonus no. 3 : The Rare Books and Special Collections of the Library of Congress and Special Collections at the University of Delaware Library maintain complete sets of the books that result from this workshop. Having your work in those collections makes for a pretty cool line on your résumé, too. Not just for workshops, this meander book format also makes a carefully-crafted, fine press book. John Dorsey, an Ohio poet, wrote 12 short poems specifically for this Lead Graffiti book, produced in an edition of 125 signed and numbered copies, plus 12 deluxe copies, each encased in a clamshell box. The studio buzzes as ideas and typography come together. A bit of bright color and a lot of concentration make for a satisfying broadside. Getting familiar with type through touch makes you more aware of the design decisions you need to make. The first print rolling off the press always makes a good photo op. A nip here, a tuck there and before you know it, you've made a book.